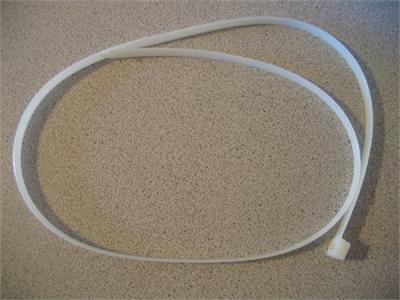 Large Cable Zip Tie - This is a 36" Cable Zip Tie that is about 1/4" Wide. It's the thickest and largest one that we can have made. Each tie will support 175 lbs of weight. These are perfect to attach between the seat and the back of a metal frame, to keep the seat from bending under weight. There are C Clamps, or other metal pieces that fit into holes in the metal seat and back that usually do this, but if you don't have those, these work very well, and will fit any frame. We usually attach and tighten them when the frame is in the the bed position, because they get a little looser when they are in the sofa position. Check your frame to see if they would be looser in the sofa, or the bed position, and attach the zip ties in the position where they are looser, so that they aren't too tight in the other position. Don't forget to cut off the excess plastic piece. 1 Tie will work, but if there are larger people using the frame, 2 or 3 are a good idea.